While improvement science has experienced a surge of interest over the past 30 years, applications of it are rare in the evaluation literature. case chapters that offer an inspiring review of state-of-the-art improvement science applications. Cutting across all of these applications is a shared grounding in systems thinking, a determination to capture and better understand variation and contextual complexity, as well as a sustained commitment to generative learning about projects and programs—all issues of great concern to evaluators. The issue offers producers and users of evaluations the potential benefits of a closer engagement with improvement science. This is the 153rd issue in the New Directions for Evaluation series from Jossey-Bass. It is an official publication ofthe American Evaluation Association. Christina A. Christie is professor and chair of the Department of Education in the Graduate School of Education and Information Studies, University of California, Los Angeles. Moira Inkelas is an associate professor in the Department of Health Policy and Management in the UCLA Fielding School of Public Health and assistant director of the Center for Healthier Children, Families and Communities. Sebastian Lemire is a doctoral candidate in the Social Research Methodology Division in the Graduate School of Education and Information Studies, University of California, Los Angeles. 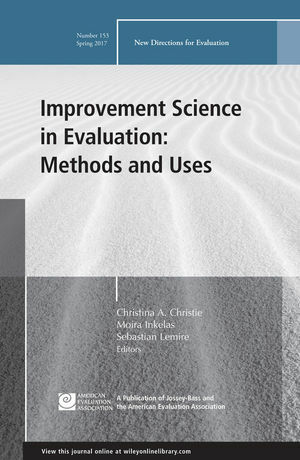 This chapter considers the similarities and distinctions between improvement science and evaluation according to use, valuing, and methods. This chapter introduces the intellectual foundation, core principles, and selected tools of improvement science. This chapter illustrates the application of quality improvement science techniques to iteratively address family- and system-level barriers to primary care. This chapter illustrates how a network of diverse organizations can use iterative learning cycles to come up with promising ideas, test and prototype these ideas, and spread and sustain what is found to work for a community population. This chapter describes the implementation of rapid cycles of evaluations (Plan–Do–Study–Act cycles) to adapt interventions to local school contexts. This chapter considers the potential value of combining improvement science and online learning. This concluding chapter reflects on the case examples comprising this volume and considers the major benefits and implications of integrating improvement science more firmly in evaluation.